Have I ever told you about my younger brother Michael and his cookie dance? When he was around two years old he used to do this thing where he would throw his arms up in air and the wave them around as he swung his hips and chanted cook-ee! cook-ee! cook-ee! It was as if he was trying to pull off his own rain dance, but for cookies instead. To this day I can’t help but do the cook-ee chant in my head at least once in my head while baking cookies. It’s just one of those images that just sticks with you. The image of a little two year old hopping around in his pull ups is even better now that he’s grown to be this 6 ft tall 14 year old that can easily pass as 18. Even though Michael hasn’t done the cookie dance in years because he’s a much more mature and reserved kid, I know inside he still gets the same excitement over cookies and such that he used to. I think since moving to England I get even more excited thinking about fall/holiday baking. It’s this time of year that I make the journey back to Arizona to visit my family and when that happens – baking is a must. When I still lived at home I used to babysit both my younger brothers a lot. Instead of dropping them off in front of the TV – we made cookies. Lots and lots of cookies. Even now when I go back it’s just what we do. This year I’ll be going back to Arizona in November and Matthew is already brainstorming things to make. 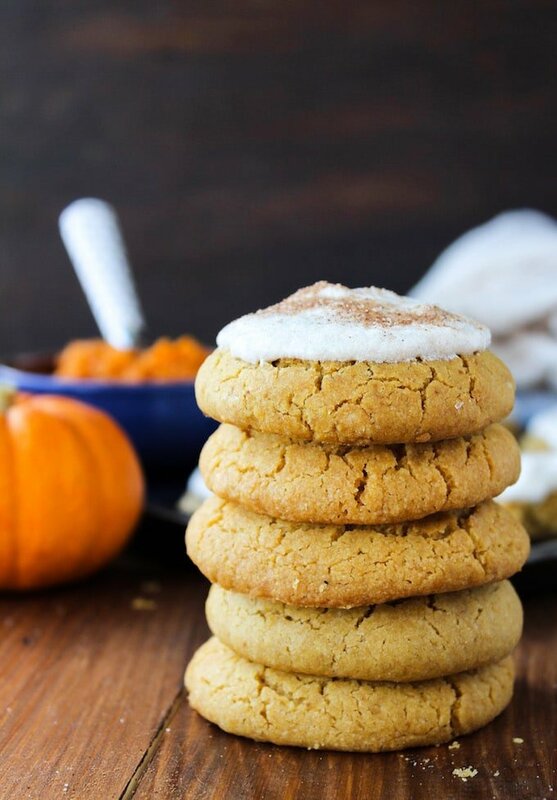 Narrowing down that list won’t be easy, but these vegan pumpkin cookies should definitely be on it! If you plan on doing any baking with kids this year I would highly recommend you make these! and are a great dairy/egg free treat for anyone with food allergies. 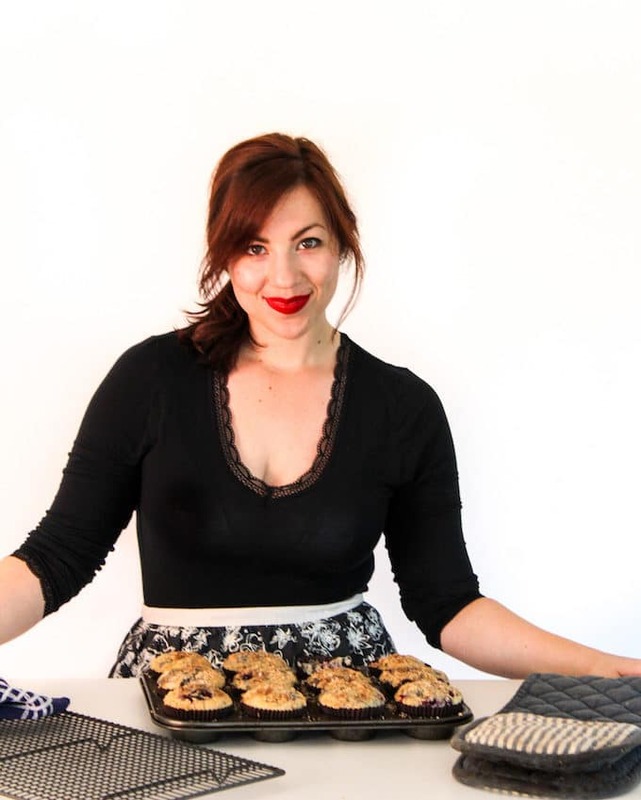 I adapted this recipe from Minimalist Baker – you can always count on Dana for great recipes! The original sugar cookies weren’t gluten free, so I played around with a couple of things so that it could work with gluten free flours. While I personally love the pumpkin pie spice in this frosting, these cookies are also really great without anything added to them. If you want to ditch the frosting, but still want that pumpkin pie spice you can always just mix the spices in the dough and leave it there. After you take these cookies out of the oven, please try to resist the temptation to pick these up too early. They harden on the baking sheet as they cool down. If you try to pick them up too early there is a good chance they’ll fall apart on you. Just let them sit and cool and you’ll be good to go! I promise – these cookies are worth dancing over! 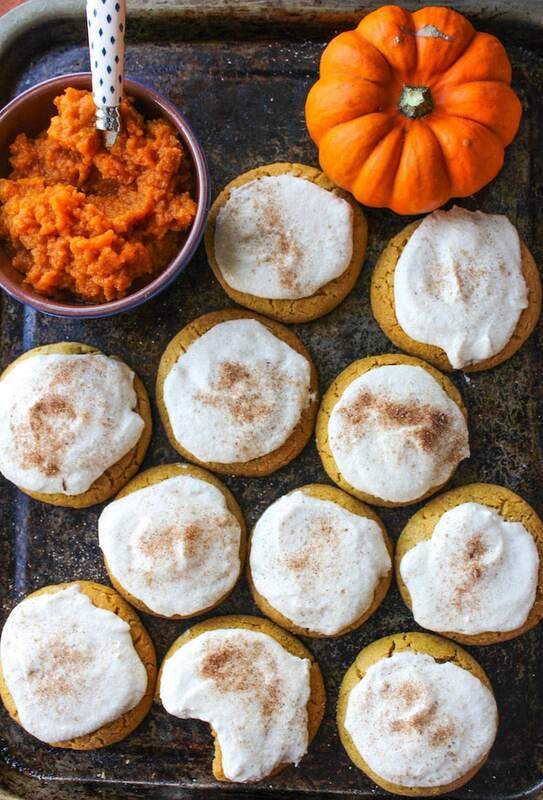 Don’t forget to #asaucykitchen on instagram if you try this vegan pumpkin cookies. We love to see what you make with it! You can also post your pictures to my facebook page! Preheat your oven to 350°F /180°C and position a rack in the center of the oven. Line a baking sheet with parchment or a silicone baking mat. In a large mixing bowl beat together the butter, cane sugar, and brown sugar with an electric mixer. Add in the pumpkin puree and vanilla extract and continue mixing until combined fully. With a wooden spoon add the remaining dry cookie ingredients and mix until combined. The dough should be soft at this point. Roll the balls into 1.5 tablespoon balls. Place them on the baking sheet a few inches apart. Slightly flatten the balls to help them spread while baking. Place them in the oven and bake for 8- 10 minutes. If they haven't spread much, gently press down to help them flatten out more. Remove the baking sheet from the oven and let the cookies cool completely on the tray before trying to move them. Moving them too soon before they set may lead to the breaking. The longer you leave them, the chewier they'll be. Wipe down the bowl you were using earlier and beat the butter on high for 1-2 minutes. Add in the vanilla extract along with the powdered sugar. Start off with 2 1/2 cups sugar - if the frosting isn't thick enough add another 1/2 cup 1 tablespoons at a time. Finally, beat in the pumpkin spice and mix until everything is fully incorporated. IF your frosting is too thick you can add a teaspoon or two of non dairy milk to think it out. Once the cookies are fully cooled frost the tops and add a sprinkling of pumpkin spice over the tops. Store these cookies covered at room temperature - unfrosted these will keep for about a week. Frosted they will keep for 2-3 days. makes 10-12 cookies Instead of pumpkin pie spice, you can use 1/4 teaspoon ground nutmeg, 1/4 teaspoon ground cloves, and 1/2 teaspoon allspice. Don’t use coconut oil. Use butter. Our cookies turned into one giant sheet pan cookie and barely rised because they were so oily. Ooh that’s good to know! Thanks so much for coming back to let me know what you thought – so glad you liked them! I made these and they are delicious and so easy! Thanks Tracy! Thanks for coming back to let me know how you liked them! Just made these and unfortunately, they weren’t what I had hoped for. They are VERY oily. I used exactly what the recipe called for. And they’re also way too sweet! They definitely have pumpkin in them, but not the traditional “pumpkin spice” flavor I was hoping for. I added the spices into the mix because adding the frosting would have been even more sugar, which I didn’t want. A little disappointed at how sweet and oily these were. Hi Tara – Sorry to hear you didn’t like these! Did the cookies come out oily in the end or was it just the dough that was oily? As for the sweetness they’re supposed to be sugar cookies so they’ll be more sweet tasting that average cookies. Maybe that’s just a preference thing? Hi. Can i use whole wheat flour or buckwheat flour for this recipe? Gluten free is not available where i stay. Hi Tania! I’m not sure how whole wheat would work in this recipe since it’s been years since I’ve been able to bake with wheat/gluten flours. I do think buckwheat would work although it will change the flavour/texture a little. Bob’s Red Mill 1:1 should be great with this! Hope you like it! Oooh, these look wonderful! I’m all about holiday baking too, and I’m about to start my planning as well, lol! These are lovely, a perfect weekend baking project! Baking cookies always brings back great memories of my childhood! 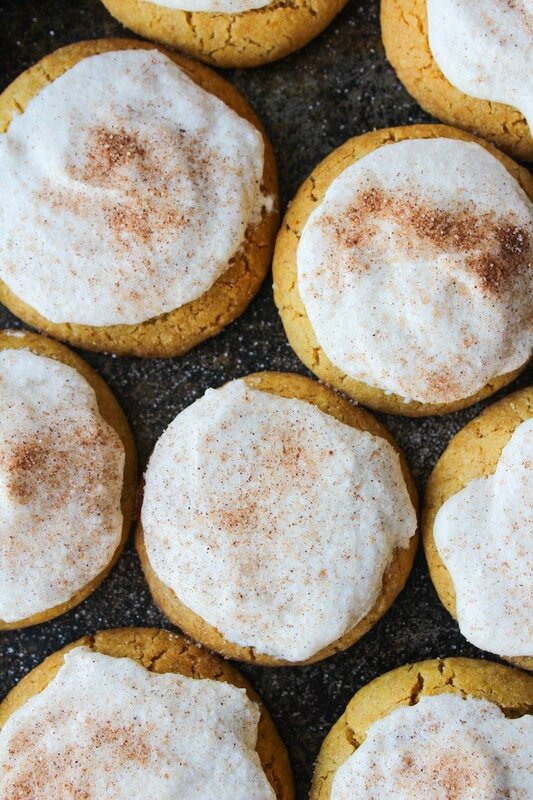 My mom makes these amazing pumpkin cookies with cream cheese frosting, but they are so sugary and sweet! Your recipe looks similar to hers, but definitely less guilty! I’m going to show her this recipe when I go home next weekend!